Policy for using photos and/or text from this web site. Frisco 1522 is a 4-8-2 'Mountain Type' Steam Locomotive built in 1926 by the Baldwin Locomotive Works of Philadelphia for service on the St. Louis - San Francisco (FRISCO) Railway. Retired by the Frisco in the early 1950s, she was donated to the Museum of Transportation in St. Louis for display. 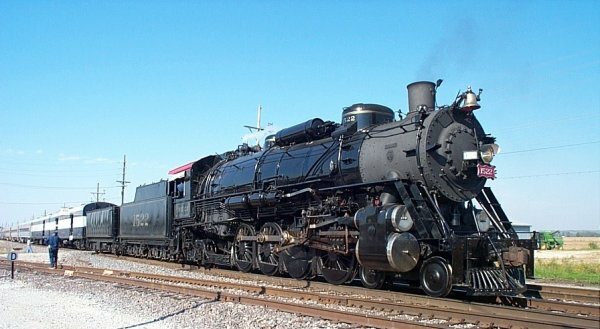 In 1988, the all volunteer St. Louis Steam Train Association completed a 3 year restoration of the 1522, beginning her second career as an excursion engine throughout the Midwest and South. Rising insurance costs and limited access to the mainline, coinciding with an expensive, required boiler inspection forced the 1522 out of excursion service and back into retirement as of the end of 2002. The St. Louis Steam Train Association was also dissolved at the end of 2002. A small group of former crewmen did attempt to put together a plan in the mid 2000's to get the 1522 back under steam but was unable to make much progress. With the locomotive owned by St. Louis County, the crew cars transferred to the Transportation Museum Association and our former tools and supplies locked up at the Museum, getting all the pieces back into place proved too much. Another big factor is the age of the crew - we had all aged 20 years since the original restoration was started and many of the original crew were retirees at the beginning. As expected, after leaving a 10 year waiting period for anyone to restart operations, the Transportation Museum Association sold off the Firefly, Black Gold, Bluebonnet and the 1522-A water car - a move effectively ending any chance of running 1522 again. At least we former crew have the satisfaction of knowing our hard work on those cars is now benefiting the Milwaukee Road 261 operation and the Ohio Central. The St. Louis Chapter of the NRHS has been kind enough to host a republication of the former Frisco 1522 website. As former SLSTA webmaster, I am honored to be called back to maintain it. Since there is no real news to report, this website will be more of an historical look back at the SLSTA and the operations of the 1522 and her support train. It will be a work in progress with lots of photographs, a listing of 1522's travels in her second life, and some recollections from the webmaster and hopefully other members of the crew. So check back often for updates. 1522 Retirement FAQ page available. Use the links below to learn more about America's favorite 'Mountain'! Everything you ever wanted to know about the locomotive! Learn all about 1522's rolling entourage! Good friends who have been taken from our crew.